For more than a generation after World War II, many Austrians insisted that Austria was a victim of Nazi aggression in 1938 and therefore no responsibility for German war crimes. During the past twenty years, this myth ha been revised to include a more complex view of the past – one with both Austrian perpetrators and victims. This volume richly illustrates this view. 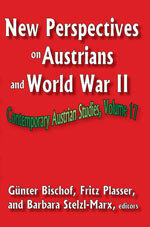 Gerhard Weinberg places the role Austrians within the larger story of World War II. Mit Beiträgen von Brigitte Bailer-Galanda, Siegfried Beer, Eva Blimlinger, Ingrid Böhler, Winfried R. Garscha, Ela Hornung, Stefan Karner, Philipp Lesiak, Oliver Rathkolb, Peter Ruggenthaler, Barbara Stelzl-Marx, Andrea Strutz, Gerhard L. Weinberg u. a.